Yesterday, we celebrated our son's birthday in a way a teenager enjoys. We watched the latest Batman flick, famous for its superhero cult status, but infamous for the tragic shooting in Aurora, Colorado, last month at a movie premiere. It took a while for me to get over the link between the shootings there and the immense violence in the movie. For all the negative connotations and the bad news, there are some good themes to take away from the movie. The storyline is the usual initial happiness, followed by a downward despair toward the middle of the film. Following that, just as it seems that the worst is becoming worse, where the villains seem to be winning all the wars, there flickers a glimmer of hope amid the climate of despair. I told my kids that there are at least five themes to learn from the movie. They said I reminded them of their English teacher who seems to see meaning in every kind of movie. I smiled. Maybe, that is the nature of my training, to be reflective and always trying to perceive some truth out of everyday life. For this week, I will try to piece together three major themes in the movie that I feel resonate strongly with my Christian faith. The movie begins with widespread celebrations of heroes of Gotham City, who has played a large part in eradicating organized crime from the city. With media blaring away, and the accolades flowing down throughout for Harvey Dent, all things appear well on the surface. Unfortunately, Dent is not saintly at all, for his crimes have all been covered up, with the full knowledge of the Police Commissioner, James Gordon. Instead, Batman takes the fall, and retreats to his own private world. Like many instances in the world, beneath the layer of smiles and happy faces, belies pain and some kind of wrongdoing. I remember a Police commercial that says: "Low crime does not mean no crime." If there is one major theme the movie has, it is this. Evil is real. The movie is dark, not just for the title but also for the general lighting throughout the movie. Batman's costume is dark. Catwoman's mask is black. Virtually the entire police force are trapped in a dark underground. The lighting is not that great, perhaps, to generate a sense of gloom and doom for the fictional Gotham City. As the evil Bane pounces on all the innocent people, and tries to instill a misguided sense of justice, the entire city is held at ransom. Even outside help like the military from the rest of the country has to play by the rules of Bane and his violent criminals. Abraham has also encountered evil firsthand. Most notable is how he pleads with God to spare Sodom and Gomorrah, on the basis of a few good men. Unfortunately, the evil of the two cities have turned out so bad, that God had no choice but to destroy the city. Remember how in Genesis 19, that evil threatens to invade the household of Abraham? For all the theory that Abraham argues with God, about justice and righteousness, Abraham has no clue about the reality of great evil. God has to intervene. Theme: Seeing no evil does not mean there is no evil. I asked my kids about how they feel about the movie. One of them even gave a 2.5 stars out of 5! While they tell me that there is too much shooting, I feel that the dark theme in the movie is actually more depressing than their expectations of a superhero movie. In baseball, once we have three strikes, the batter is automatically called out. The downward spiral of defeat and despair does appear very depressing for most parts of the movie. We see how helpless Bruce Wayne has become, to see his billions disappear with just a theft of his fingerprints. We see how the precious technological gizmos Wayne Enterprises have developed, fall into the very hands of the enemies. We see how time and again, the catwoman betrays the trust of Bruce Wayne, the ridiculous pursuit of Batman at the expense of the obvious villains, and the non-stop victories of the invincible but despicable Bane. Even the name of the villain personifies pain. The women in the movie show more reasons not to trust people. See how time and again the catwoman steals, humiliates, and misleads the mighty batman. The proverbial stab in the back comes from none other than the woman Batman trusts most: Miranda Tate. Just when Batman has the upper hand on his archrival, Bane, along comes Tate hurting Batman not only with her dagger, but piercing his deepest emotions. The truth be told, that Miranda has been conspiring all along with Bane, to trick Wayne Enterprises into developing a thermonuclear device to blow up Gotham City. Thinking of Abraham, many years have passed since the promise of God to make him a father of all nations. After barely surviving the horrible encounter with deranged men of Sodom and Gomorrah, he sees his wife nearly taken by kings of the foreign lands they enter into. He foolishly risks Sarah's life by pretending she is his sister (Genesis 20:2). Due to inner feud between Sarah and her maidservant, he is forced to send away Hagar and his descendent Ishmael. Moreover, he has to sacrifice Isaac, his only son! Instead of seeing God giving Abraham one son after the other, God is asking Abraham to sacrifice his one and only son. Hello? Did Abraham mishear anything? Key Theme: Despair can be tormenting. For some, the saying "it will get worse before it gets better" will appear long and unending. This is perhaps the biggest feeling I have, seeing the rising of Batman again, and the image of the Resurrection of Christ. When all seems lost, when everything appears headed for doom, suddenly there is help. Catwoman has a change of heart, and becomes a key ally. The inspector John Blake appears unscathed, and continues to be a force to be reckoned with despite him being ordinary and outnumbered. Of course, the bad guys do not get all the best stuff. Batman still has a few other special weapons hidden away from the sights of the enemies. What is most crucial is the renewed spirit to want to save the city rather than taking revenge. In many Rambo-style movies, we see the desire for revenge outweighs all other emotions. As anger turns to wrath, and fear into hatred, many of these heroes seem to develop a fighting evil with evil mentality. They attempt to respond with heavier artillery or more powerful weaponry. 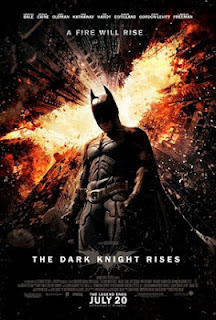 As moviegoers watch Batman crawl and climb out of the pit, it is symbolic of hope resurrected. With the new-found spirit, and the overwhelming resolve not to let evil has its last say, Batman rises from the ashes of defeat, to save Gotham City. In response to Catwoman's plea for him to save his own skin, after all the nasty treatment inflicted on him, Batman refuses to give in to the temptation to flee. Instead, he is fixed on doing the right thing. He wants to rise again, for the sake of the city. Abraham could have given up on waiting for God. Yet, he believes God. He offers his son Isaac up willingly at Mount Moriah. For that he has been credited for righteousness. Despite his wife's age, he continues to trust God to provide him offspring. The Apostle Paul calls Abraham as one who believes "against all hope." For Christians, the biggest hope is none other than the Resurrection of Christ. See how not just one, but all the disciples flee at the arrest of Jesus. See how everyone returns back to their normal lifestyles after the death of Jesus. See how surprised people become when they hear about the Resurrection of Jesus. If only they had believed. I wonder how many of us actually believed that Batman can rise from the dead. Toward the middle of the movie, I must admit that the darkness seems most invincible. Even the mighty Batman has been badly beaten up by Bane, who defeats Batman with his bare hands. See how thousands of law enforcers are trapped, releasing lawlessness into the streets. I like the way Paul renders Abraham's faith. We know that in the movies, the superhero will always win. What about life? Will we believe in our hearts that God will always win? Or are we more tempted to disbelieve in the light of hopelessness? In the aftermath of the terrible shooting in Aurora, the theatre management gives out a one-statement survey for their community. "As Aurora moves forward after the tragedy of July 20, it is our hope that the entire community will participate and benefit from the citywide healing process. Many people have asked about the future of Aurora's Century 16 theater. We want to know your thoughts. Please take a few minutes to tell us your thoughts. These comments will be shared with Cinemark for consideration in their decision making process." The way that they put the words, "it is our hope" seems rather ambivalent. It appears distant and uncertain. For us as Christians, hope is not just wishful desires, but a reality that is anchored on the resurrection of Christ. As Jesus appears to the disciples, he does not simply ask us to hope. He calls us to declare the good news. He calls us to make disciples of all nations. He calls us to receive power from above, and to begin witnessing to the ends of the earth. Jesus is the personification of True Hope. He is not the dark knight but the Bright Shining Morning Star. Marriage Therapies Don't Work. Do They? Is God Cruel and Unjust?